First- a little business! The winner for the Southpaw Crafts giveaway was announced. Congratulations to Rachel M! Check your email if you haven't already.... Now- on to the post! Anyway, it was a very special day for her and for us. We were so proud of her for making the decision to be baptized. It really was her decision- we talked about it, and prayed about it, and she met with our bishop (who happens to be my husband!) for a special interview to make sure she was ready. One of the special gifts that we gave her was her own set of scriptures. I know she is old enough to not only read them, but to study them and learn about them more in depth. She was thrilled to have her very own Bible, along with the scriptures we read in our church. 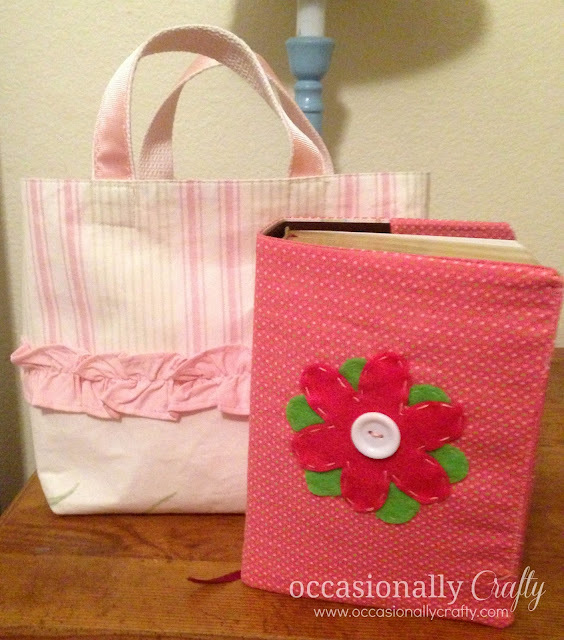 Being the "crafty mom" that I am, I had to make her a cover and a tote for her scriptures. First up was the cover. I knew it had to be pink, as that is by far her favorite color. I loved the lime green polka dots in the fabric that gave it just a little more fun. I sewed the cover using this tutorial from Delia Creates, though I had to cut off about an inch of fabric to make it a snug fit. When I showed it to my daughter, she said- "I really wish it could have a big flower on it". Wish granted, sweetie. 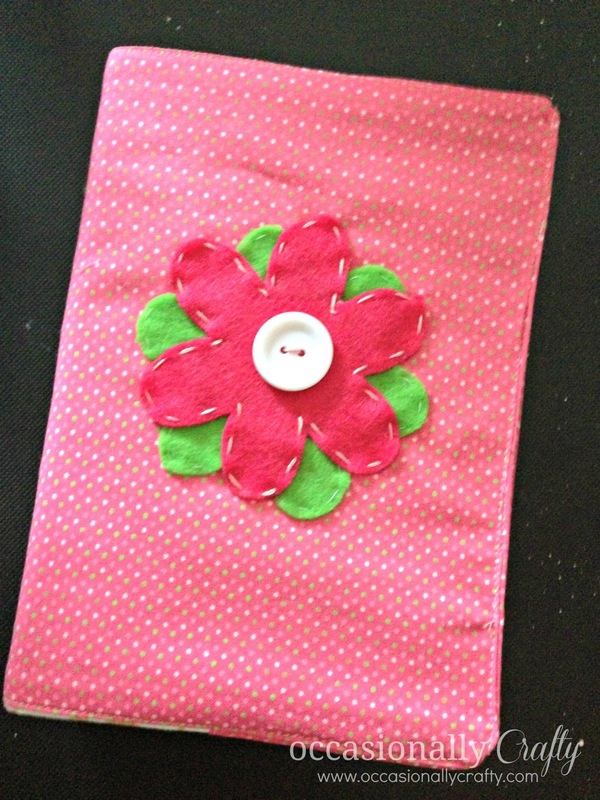 I cut two flowers out of felt, layered them, then stitched them onto the cover with embroidery floss. A big button in the center completes the look. For the scripture tote, I used a place mat that I bought expressly for this purpose a year and a half ago. I knew the ruffle would be a hit with my girly daughter. I didn't use a tutorial, but making a tote out of a place mat is simple! 2. Sew up the long sides- I used a 1/2 inch seam allowance. 3. Square the bottom if desired (I used part of the tutorial here to get it right). 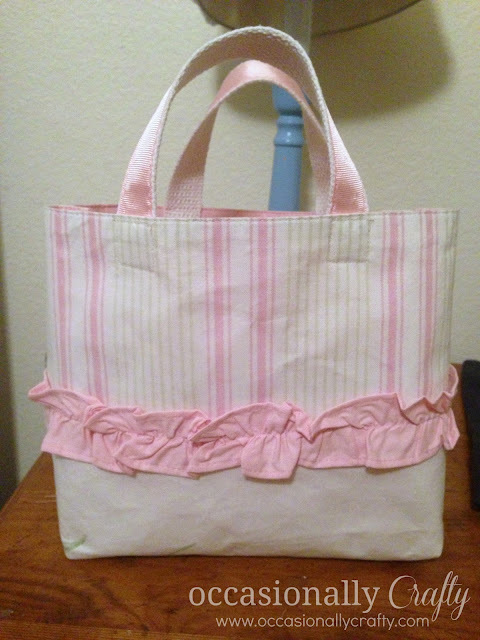 For handles, I used 1 inch cotton webbing and 7/8 inch wide pink grosgrain ribbon. 1. Measure the webbing to the length you want your handles. Cut two. 2. Cut two pieces of ribbon the same length as your handles. 3. Sew the ribbon to your handles on each long side. 4. Center your handles on each side of the tote bag, making sure they are placed evenly between the side seams. Pin in place. I may or may not be linking up at some of these parties ;) Come check them out too!